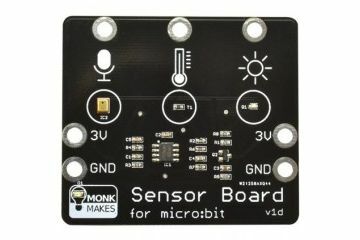 The MonkMakes Sensor Board allows you to detect sound levels, temperature and light levels. It features ring pad connectors for use with crocodile clips make it easy to connect to the board to a microbit. Sound Level: It senses sound level with a MEMs, which is a microphone on a chip that also features a pre-amplifier circuit. You can then use the plot bar graph block in the Microsoft MakeCode editor to display the result on the microbits LED matrix. Temperature Level: The temperature output from the board is a voltage that indicates the temperature. This is then measured using an analog input on the micro:bit. If you want your temperatures in Fahrenheit, then multiply the temperature in degrees C by 9, divide the result by 5 and then add 32. Light Level: The light sensor uses a photo-transistor to measure the light level and produces an output voltage that increases as the light level increases. It has 3V and GND connectors on both sides of the board which make it possible to power another board, such as the Relay Board or Powered Speaker Board. - 3V and GND connections can be made from either side and allow you to power a second board such as the MonkMakes Relay Board or MonkMakes Speaker. - LED power on indicator. - All three sensors are analog and can be connected to pins P0, P1 and P2 using alligator clips. - Detects sound level with a MEMs (microphone on a chip) and a pre-amplifier. - Uses a thermistor to measure temperature. - Light level detection with a photo-transistor (0 to 1023). 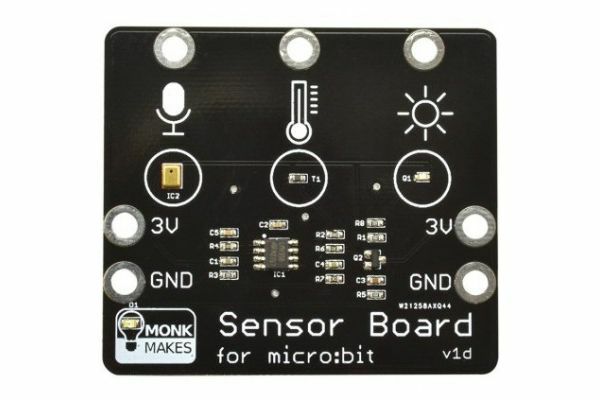 - 1 x MonkMakes Sensor Board for the BBC micro:bit. - Sensor Board getting started guide.